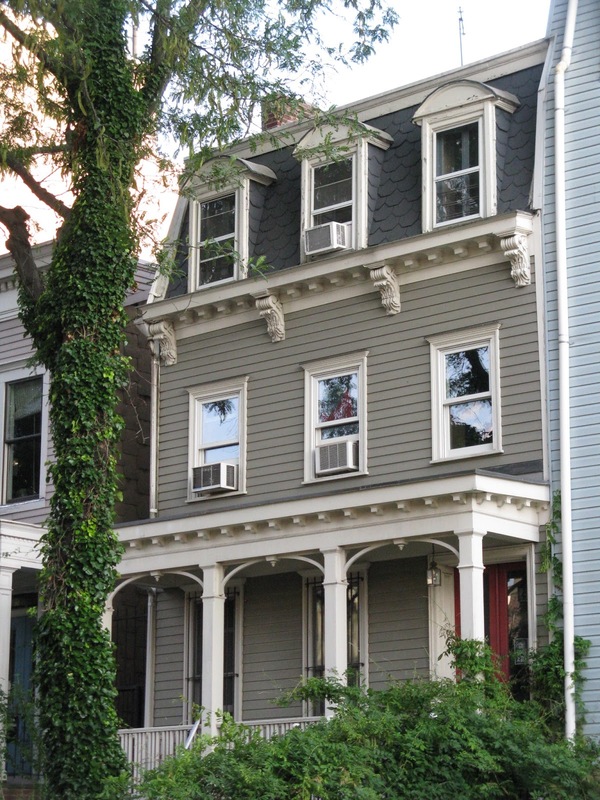 Wooden houses and present-day New York City don't sound like a natural fit. By 1900, you couldn't build wooden houses in Brooklyn that had just become part of Manhattan where wooden houses were outlawed because of their propensity to catch fire. No wonder, considering, with no electricity at that time, families were roaming around their houses with lighted candles. So imagine my surprise when, on a walking tour with the Wooden House Project, I learned that 50% of the houses in Brooklyn are made of wood. The Project's founder, Elizabeth Finkelstein and Chelcey Berryhill, one of the contributors to the Project that delights in everything about wooden houses, led our small group through the streets of Brooklyn's South Slope one recent sweltering day, pointing out these reminders of the past that are often concealed by none other than vinyl siding. Many of us had the erroneous notion that these wooden dwellings were once old farm houses. In fact, they were Brooklyn's early row houses in this neighborhood where most everyone worked in the Ansonia Clock Factory, the major employer dating from 1879, and the stimulus for the neighborhood's development. Webster Place – it's a row of 1867 houses with simple porches. This block is what most of the streets once looked like. 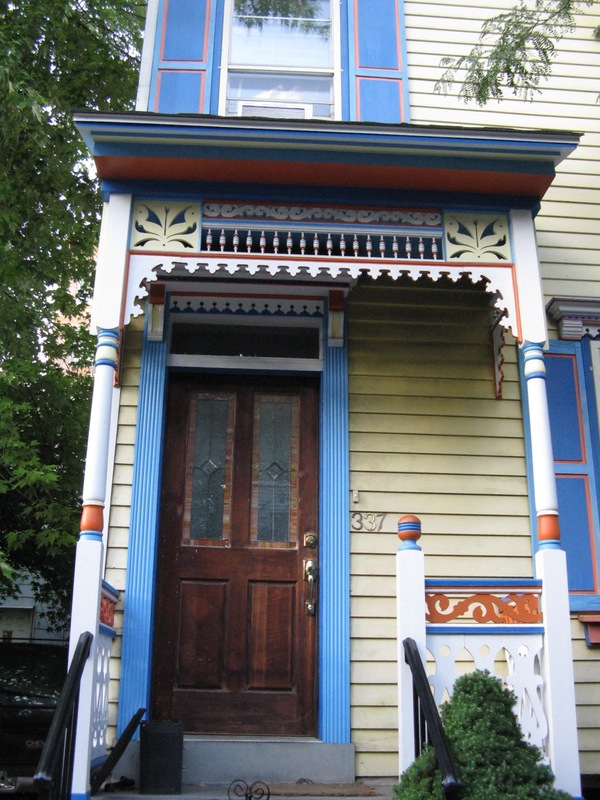 The gingerbread detailing, with spindles and portico columns are not original, but they are of that time. Dating from 1863 , this house is located in the Historic District. From this house, the original owners would have views of the Ansonia, which was set on rocky land with immense embankments. The mansard roof on this dormered house was popular in the 1860s. It was popular in the 1860s then fell out of favor only to return again in the 20th century. Aside from these treasures, we also learned that a lovely yellow house on 11th Street between 7th and 8th Avenues was moved to this spot between 1886 and 1898. On 12th street between 6th and 7th Avenues, a carpenter owned the early cottage row house, circa late 1850s, that's snuggled between two brick brownstones. Since there were few architects at that time, houses like this one were built using pattern books illustrating what was trendy. But for all the love we hold for wooden houses, they wouldn't still be around today, at least not in the good condition they are in, if it weren't for the aluminum or vinyl siding we find on many, like the row of six houses, all clad in different siding on 15th street between 6th and 7th Avenues. This is an inexpensive way to protect the wooden facade. And protection is what they need because once these houses are all gone, that's it. Because they're outlawed, you'll never find another wood house in New York City. Enjoy 'em while they last. I had no idea you couldn't build with wood. But I guess it makes sense. How interesting! I never would think houses like these still existed - or ever did - in Brooklyn. Love the photos. 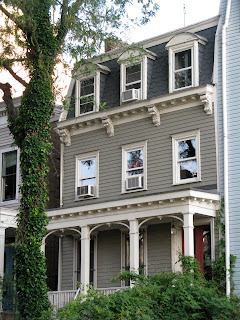 Hi Sheryl, Before I went on this walking tour, I never thought about wood houses in NY either. How surprising. Hi Brette, Yes, it absolutely makes sense. I just didn't know it was outlawed. This sounds like a walking tour I would very much enjoy. Love the history of NYC and love these old wooden houses. I really enjoy walking tours of homes. How interesting this one must have been. Fascinating - who knew? I always associate Brooklyn with high rises and the like, but not this. It comes from having only really visited as a child, and remembering only what I'd seen the multiple times I went. Hi living large, I'm hoping to sign up for another of their walking tours later this year. It was really educational. Hi Heather, I love walking tours that present surprising findings. This had a wealth of them. Hi merr, I know. Me too. Especially given all the high rises going up in Williamsburg. Nice to know there are wooden houses still standing. Really lovely. I love walking tours. Love just wandering around neighborhoods and cities. Hi Jane Louise, Walking tours are great for exploring neighborhoods, even those close to home. You're always bound to find something you didn't know.